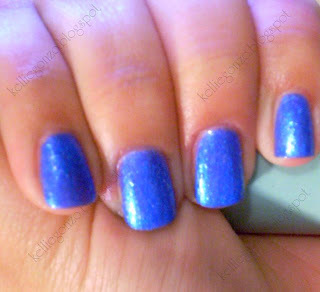 this notd is a blue sparkly called dare by petites that i got at walmart. i'm not terribly impressed unfortunately. i don't love the bumpy texture, but hey what can you do with glittery/shimmery polishes? it's a pretty darkish cornflower blue. and cheap at $1.29, so i might give the other smooth ones a try next time. hey why not?